Careers360 interviews Somnath Patil, secretary of DY Patil group who shared his views on different areas. In this interview, he talked about regulatory regime to quality control and explains his guiding principles. Read this interview to know what the youthful secretary says on role of Universities in this country and the responsibility of carving quality students. Careers360: What is the role of universities in the country? Do you think they contribute to nation building? Do we follow a system or do we blaze new trails? 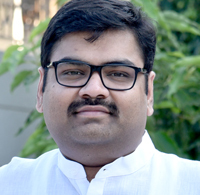 Somnath Patil: Deemed to be Universities, Private Universities and the Autonomous Institutes have a great role to play in today’s academic scenario. The University system has to a large extent a straight jacket method of studies. They have a fixed curriculum and also have the course delivery system and the method of assessment. On the other hand in case of Autonomous Institutes there is a lot of flexibility. They have a large flexibility in all these areas. This makes it possible to design the curriculum as per the market requirement, and also the course delivery and assessment method. This helps the passing out graduates in having the skills required by the market. In today’s competitive business environment, the passing out students are expected to have the necessary skills which will make them productive immediately upon their passing out from the college. In the conventional system, amending the course structure, curriculum, etc. is a very lengthy process. Careers360: Do we accord respect to institutions set up outside governmental perview? Considering their contribution are they treated in a well-deserved manner? Somnath Patil: Generally there is myopic tendency to look at the Autonomous Institutes. Public at large, feel that, these Institutes and Universities have different motives. On the contrary, these are the Institutes which fulfill the Industry requirements as far as the students’ knowledge and utility is concerned. This can be easily noticed from the preference these students get over the students from the conventional Institutes during the placements. Careers360: What is the fundamental cause for this ? Is it the multiplicity of the regulatory regime? Is there a regulatory fatigue? Somnath Patil: Even today, the academic institutions are going through a lot of red tapeism. There are various Councils which control the education besides the UGC. You have Medical Council of India, Dental Council, Nursing Council, AICTE etc. controlling Institutions and courses in various disciplines. Thus even though there is a lot of scope and demand for various programs, there is apprehension among the educationists to enter the field. There are more hinderences than incentives to enter the field. Careers360: Is the current regime very effective? Are they doing their job well? Somnath Patil: There are various controlling Councils as mentioned above to ensure the quality of education. However it is observed that these are not very effective. Irrespective of their presence, you notice mushrooming growth of professional colleges having no quality education or even the bare minimum infrastructure. Due to the existing system, it appears difficult to control the existence of such Colleges / Institutions. Careers360: Who should finally be responsible for quality? External governance mechanism or internal motivation? Somnath Patil: In the existing scenario, it appears that it will be wholly responsibility of the individual Institute / College / University to maintain the quality of the outgoing students in terms of their knowledge, and their employability. It will be only then that the ones which produces good students will survive.